The first documented proof of the existence of plique à jour enamel is an inventory of Pope Boniface VIII dated 1295, where it is referenced in Latin as smalta clara. Anyway, the first example that reached us is the Mérode Cup with cover, made of vermeil (gilded silver) in Bourgogne around 1400. The object takes the name of the ancient Belgian family Mérode, the original owners. The Cup of Mérode, vermeil with plique-à-jour enamel, produced in Bourgogne about 1400. In the years 1380-1420, the artists began to experiment on new forms of enamel decoration, more “courageous” than the previous techniques. In particular, this is the moment of the ronde bosse enamel, developed primarily in Paris and London. A possible reason for these new developments is that, following the Hundred Years’ War (1337-1453) and, in particular, the Massacre of Limoges (19 September 1370), the School of Limoges had gone in decay and some of the enamellists found refuge in Paris under the patron John of Valois, Duke of Berry. 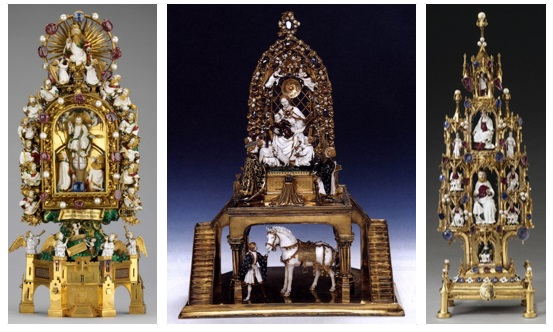 The ronde bosse enamels of the time are the Reliquary of Montalto (1377-1380), created in Paris by the goldsmith and valet Jan du Vivier and modified by a Venetian goldsmith’s atelier 60 years late; the Reliquary of the Holy Thorn (1380-1387), and the Golden Pony of Charles VI, and the Table of the Trinity, 44.5 cm tall. Noteworthy is also the famous Dunstable Jewel. The most ancient documents proving the existence of enamel in Czechia or Moravia date back to the kingdom of the House of Luxembourg. We may say that the use of enamel in the Gothic period was generally restricted to a few objects and exclusively meant to be a decorative complement to gemstones, who remained the primary ornamental element. During the reign of Charles IV of Luxembourg, the first King of Bohemia who also held the crown of the Holy Roman Empirefrom 1355 to 1378, we can witness a cultural boom that led to a rapid growth in the arts, especially architecture and jewellery, as part of the expansion works on the capital city, Prague. For example, we can find decorative enamels even on the objects from the workshop of German-born jeweller Petr Parléř in Prague. A noteworthy piece of the time is the reliquary of the Kolovrat family, produced about 1460-1470 by Martin of Hradčan, in a style that betrays the Hungarian origins of the artist. 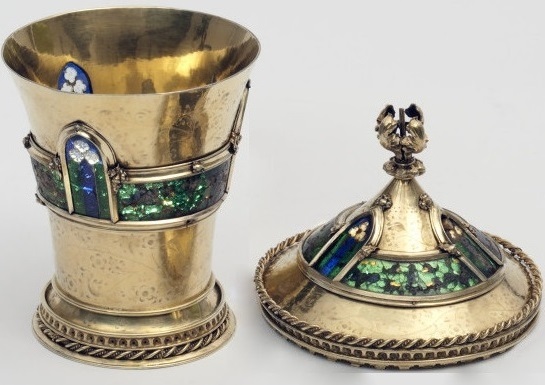 An important artefact of the late-Gothic period with little green and blue enamel decorations is the cincture traditionally associated with Queen Elizabeth, the fourth wife of Charles IV, which is really a work from the second half of the 15th century. In the early 15th century, Persian enamel came from Iran and Pakistan to China, where it was known as “Islamic ware” in the book Ge Gu Yao Lun. During the 15th century, Northern Italy, Venice in particular, switched from champlevé to painting on enamel, an imitation of painted porcelain. The greatest renovation in the field of enameling was the creation of painted enamel, almost contemporary in Italy and France. Jean Fouquet learned the art of enameling from Italian master Filarete and was the first to ever produce an enamel cameo with a technique similar to painted enamel and grisaille, a few years ahead. Enamel was now ready to become pure art: the plain and stylized figure typical of cloisonné and champlevé were abandoned in favor of the depths of design, as for the oil on canvas. The brightness improved even more with the transparences of the thin paillons of silver and gold. By the end of the 15th century, we have some 40 works attributed to the same author or atelier, known to the experts by the name “Pseudo-Monvaerni” after an inscription found on some of these works. The style has already the distinctive traits of émail peint, but nothing comparable to the more evolved paintings of the 16th century. 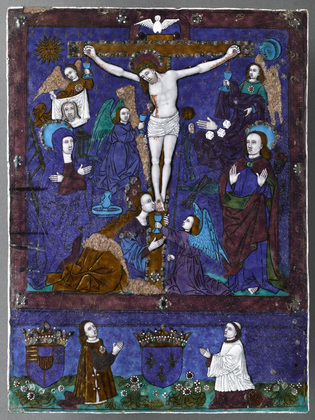 The earliest pure painted enamel work is a Crucifixion, by Nardon Pénicaud (1470-1542), dated 1503. Nardon was the head of a dynasty of enamellists from Limoges. The work, commissioned by René II, Duke of Lorraine (1451-1508), is now in the Museum of Cluny. In this period, the technique Grisaille is also born around 1530. The best creations of the period are hybrids with translucent enamels, grisaille, painted enamel and paillons. This technique will lead to the rebirth of Limoges. Amongst the best artists, we mention Pierre Courteys, Pierre Raymond, Nouailher, Jacques Laudin, Jean de Court and his daughter Susanne de Court, the first woman enamellist recorded by name. There are also a few anonymous artists such as the so-called Master of the Aeneid. 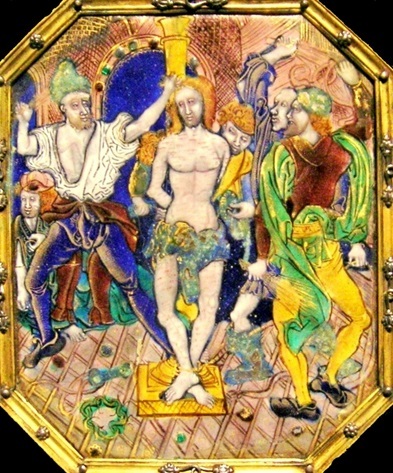 Crucifixion by Nardon Pénicaud, painted enamel, Limoges, 1503. The most famous enamellist is certainly Léonard Limosin (1505-1577), the first to be officially recognized as valet and court painter. Limosin had been admitted to the School of Fontainebleau and he was able to produce hundreds of paintings with portraits or based on his own sketches. 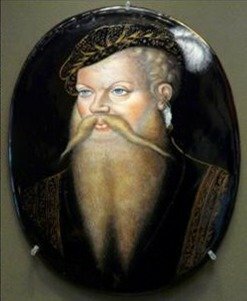 That is why he is considered one of the best exponents of Limoges enamel in the Renaissance.